edge® is thin and lightweight, measuring just 2in thick and weighing less than 9oz. edge® has an incredibly wide viewing angle, 5.5in LCD and a sensitive capacitive touch keypad. 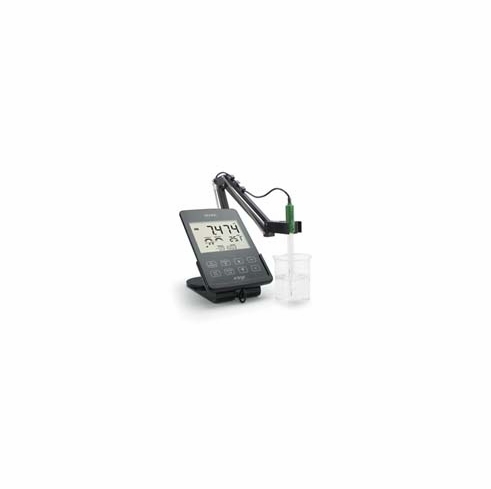 edge® measures pH, conductivity and dissolved oxygen through its unique digital electrodes. These digital electrodes are auto-recognized. Providing sensor type, calibration data and serial number when connected to edge® with an easy to plug-in 3.5mm connector. edge®’s versatile design is equally at home in your hand, on a lab bench or mounted on a wall. It simplifies measurement, configuration, calibration, diagnostics, logging and transferring data to a computer or a USB drive. edge features Hanna’s exclusive CAL-CHECK® to warn you if the pH electrode you are using is not clean or if your buffers are contaminated during calibration. Indicators are also displayed for response time and probe condition that is based on the offset and slope of the electrode. We have also added to SENSOR-CHECK for sensors with matching pin: now it warns you if the pH bulb is cracked or if the junction of the electrode is clogged. pH Resolution: -2.00 to 16.00 pH (Basic Mode), -2.000 to 16.000 pH (Standard Mode), +/-1000.0 mV for pH. pH Resolution: 0.01 pH, 0.001 pH, 0.1 mV. pH Accuracy @ 25°C/77°F: ±0.01 pH, ±0.002 pH, ±0.2 mV. pH Calibration Points: 5 – Extended mode, 3 – Basic mode. pH Temperature Compensation: Automatic: -20.0 to 120.0°C; -4.0 to 248.0°F**. Electrode Condition: YES– Standard mode (pH only). Electrode Response: YES– Standard mode (pH only). Out of Calibration Range: YES– Standard mode (pH only). pH Buffers: 1.68, 4.01 (3.00***), 6.86, 7.01, 9.18, 10.01, 12.45, and two custom buffers – Standard mode 4.01; 6.86; 7.01; 9.18; 10.01 - Basic mode. Temperature Range [°C/°F]: -20.0 to 120.0°C; -4.0 to 248.0°F. Temperature Accuracy @ 25°C/77°F: ±0.5°C; ±1.0°F. °C/°F: YES. Keyboard: 9 Keys (on/off, 8 dedicated). Interval logging with up to 100 lots (Max. 600 logs/lot). Dimensions: 202 x 140 x 12.7mm (8 x 5.5 x .05in). This kit includes one edge® meter, benchtop docking station, wall-mount cradle, USB cable, 5 VDC power adaptor, instruction manual; plus (1) HI11310 pH electrode, (6) sachets of buffer solution, (2) sachets of cleaning solution, and quality certificate.